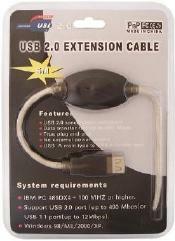 A USB repeater cable is an essential accessory if you need to work with USB 1.1 or 2.0 peripherals at a distance. 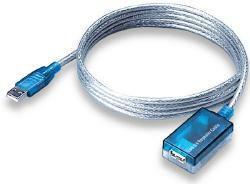 Our USB extension cable section features 10 foot and 16 foot repeaters. Be sure to check out our USB audio adapters as well. 16 foot (5 meter) USB Repeater Cable / USB Active Extension Cable. Use your USB 1.1 or 2.0 peripherals far away from the computer. Each repeater cable adds 16 feet. Serially connect up to 5 cables for farther distances.